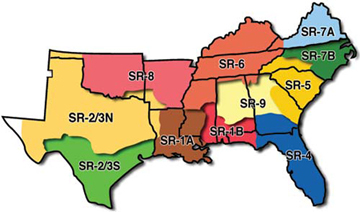 On March 21st, the Southern Region announced the details on the 2008 realignment. The current seven areas will be redrawn into nine, for a total of eleven sections (up from ten). The realignment will take effect at the conclusion of each section's 2008 conclave. 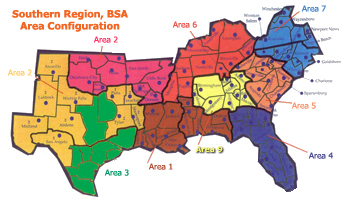 Because of certain area management responsibilities, Area 2 will consist of two different non-contiguous groups of councils, an eastern portion (Tejas, NeTseO Trails, Caddo Area, and Norwela) and a western portion, which are separated by two Area 3 councils (Longhorn and Circle Ten councils). Lodges, however, were organized into contiguous sections. The combined territory of Areas 2 and 3 will be split into northern and southern sections, SR-2/3 North and SR-2/3 South respectively. Wahinkto 199, whose council is in Area 2, will be in 2-3 South, and Mikanakawa 101 and Nishkin Halupa A Pe Lachi 489, whose councils are in Area 3, will be in 2-3 North. "It was [orginally] announced... that Tatanka would be in SR 2-3 North, but shortly after the publication the Region re-examined and decided to place Tatanka in SR 2-3 South." --Tatanka Lodge #141 newsletter, The Whispering Drum, Volume 2008, issue #4. With the addition of Pilthlako 229, Immokalee 353, and Alapaha 545 from SR-4N, Section SR-4S was renamed Section SR-4. The new section covered all of Florida except for the panhandle. Copyright © 2008-2012 by Robert Higgins. All rights reserved.